Over this fall break, I had the opportunity to work with Laurel Steinhauser’s campaign for the House of Representatives, where we focused almost exclusively on canvassing over the period of four days. I canvassed for 6 hours a day, walking through much of Cromwell, knocking on doors and hoping to make connections with voters and introduce them to Laurel’s campaign, and hopefully sway them in Laurel’s direction. 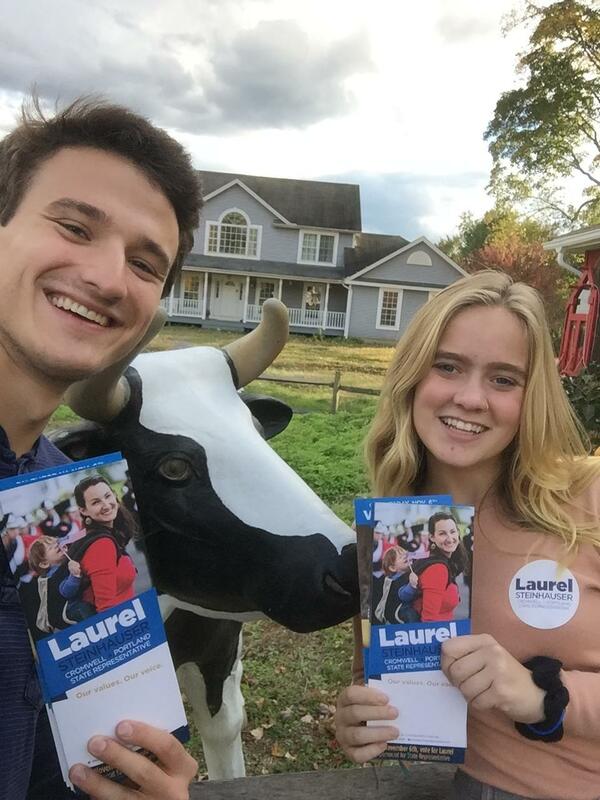 Direct contact with voters is the most important way for a local campaign like Laurel’s to gather the votes she needs, and canvassing is the most effective way of getting this direct contact. As Laurel and her campaign say often, the most important thing is to listen to the voters we connect with, and show them that Laurel wants to work on the issues important to them. In total, we knocked on hundreds of doors, meeting people from all over Cromwell and getting a sense for the community that surrounds Wesleyan. As a student, it is easy to forget about the people that surround us, and I think it is important to connect with this community and to participate actively within it, even if I will only be here for a few short years. Talking with people of all ages and political affiliations also allows you to ground yourself and your own beliefs, while also learning about the issues that real families are facing, usually far removed from the national scale of polarized politics. Locally, you begin to see the change coming from within the people and the communities, and it beings a much-needed ability to change the current political state that many liberals are grappling with today. At the end of the break, racking up to 11 miles on any given day and after many doors had been shut in my face, the people that I met made it worthwhile. After 30 doors without a single answer, I would happen on a sweet old woman’s door who would invite me in and tell me in her living room of the hope she has for the future and the ways in which her life had been affected by the current political climate. Or, a Republican’s dog would run up to me despite its owner’s clear lack of desire to talk politics to the overeager Democrat at their door, and would instead tell me about their dog and family. These types of connections far outweighed any negative experiences, along with the triumphant feeling of securing another 1 (categorized as strongly supporting Laurel) after a long conversation. Even those that didn’t agree with me were usually understanding, and willing to have a conversation about their views in a way I appreciated far more than I have in the past. Standing on someone’s door in the 40-degree weather can humble you into listening to the other side, and valuable insights can be gained through this. After all this information, I have one quick question: can Laurel Steinhauser count on your support this November 6th?